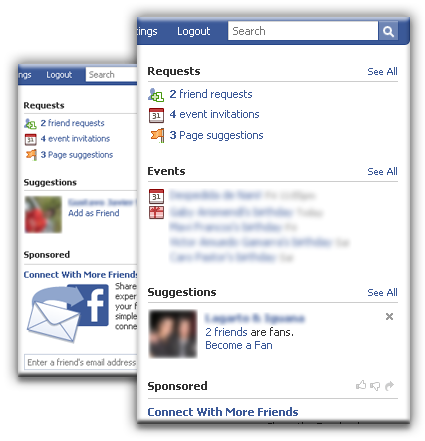 Since Facebook changed its structure, some days ago, the Move Facebook Events Box to Top script has stoppped working. I’ve just updated it to the version 1.3 to solve the problem. Please visit the original post to download the updated version. 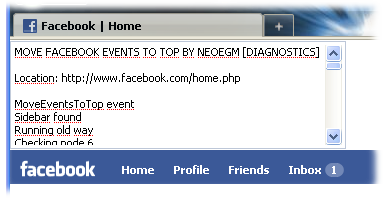 I’ve just published the diagnostics version of the Move Facebook Events Box to Top script. It’s made to help in the tracing of any kind of problem which may keep the script from working for someone. There shouldn’t be need to say that the diagnostics version is just for the ones who are having problems with the script. Please visit the original post to read the instructions and download the latest version. It has happened almost no time since the last update (I made it yesterday), but I had to make a new release to correct one remaining problem which made the script not to work sometimes with the new site structure (specifically when returning to home without reloading after some kind of actions, for example, clicking the “Return to home” link after cleaning up all the pending requests). You may have not seen the problem, but anyway I recommend the update because Facebook keeps changing the site structure and this is the best working release (its been doing its work flawlessly in every case I’ve tested it in by now). Since some days ago, the Move Facebook Events Box to Top script has stoppped working in some Facebook accounts (while it kept working in some others). It happened to be that Facebook is updating some parts of its page structure and that changes generated the problems. I’ve just updated it to the version 1.2 to solve the problem . I’ve just updated the Move Facebook Events Box to Top to the version 1.1 to solve the problem that made the events box not going to the top sometimes when loading the page or reloading. How do I install it? ?